This blog post was hard to write. Mainly because there are tons of Indian street foods I love, but I’ve condensed the list to my top ten simply because it’s easier for readers to digest (pun intended). Everything from the vibrant colours of saris worn by Indian women going about their day, to the scents (both pleasant and unpleasant!) emanating from the streets is a brand new sensation. 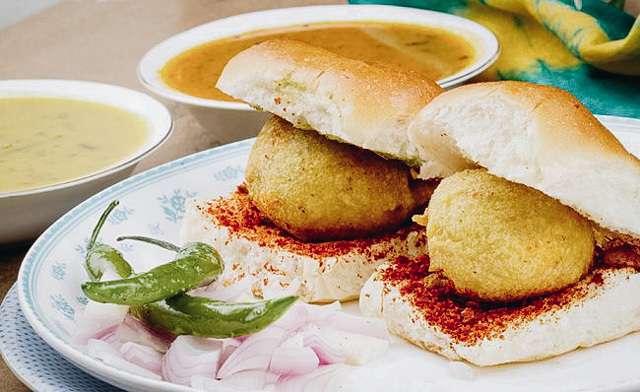 When it comes to Indian street food, foreign flavours envelope your taste buds at first bite, leaving you satisfied yet at the same time, wanting more. 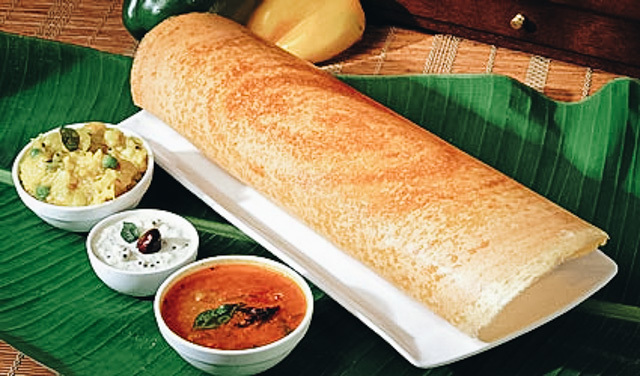 Think of a dosa as an Indian crepe made with rice and black lentils. You can get it plain or switch it up with various spices! 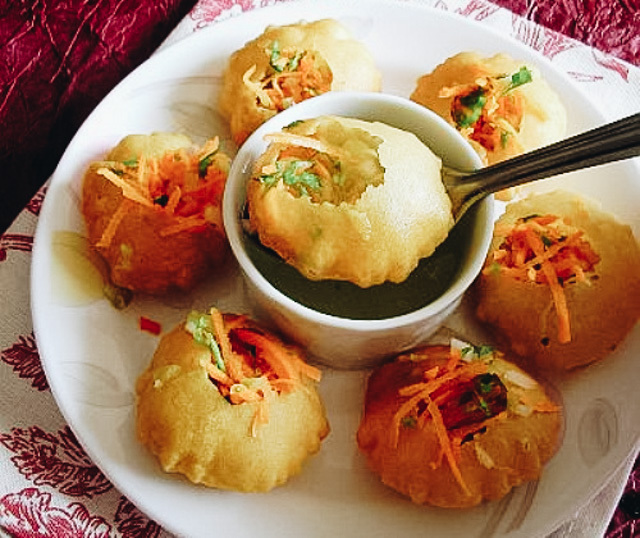 In Hindi, “pani” means “water”, and “puri” is a small bowl commonly made of maida flour and deep fried in vegetable oil. Pani puris are basically little bowls of masala (spice) mixed with water, and chick peas. Oh, and happiness. Each puri bowl is meant to be eaten in one bite! 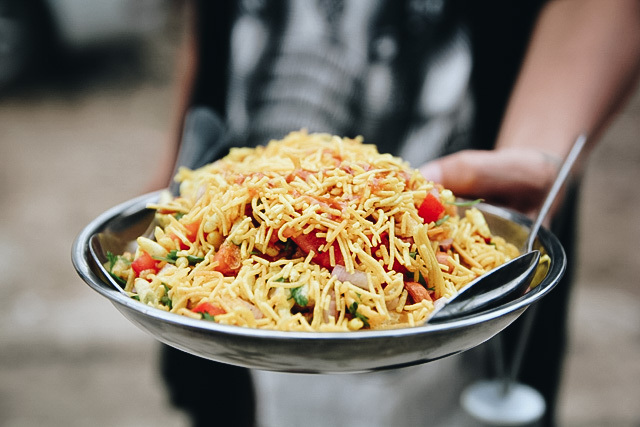 Sev puri consists of small, crunchy noodles made with chickpea flour paste. 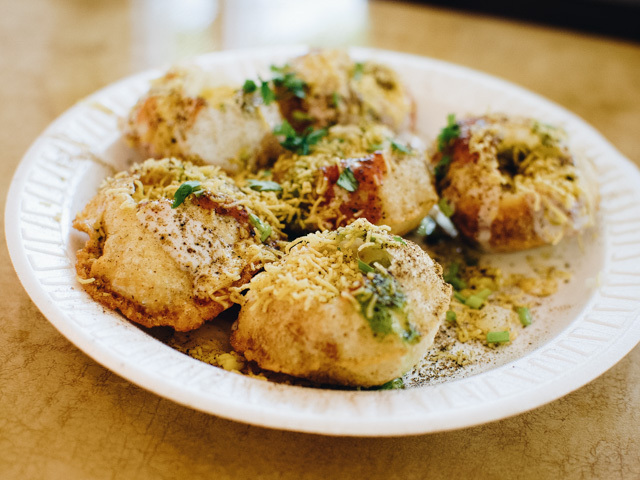 This popular street snack is similar to pani puri above in the sense that each bowl is eaten in one bite. “Dahi” means “yogurt” or “curd”. 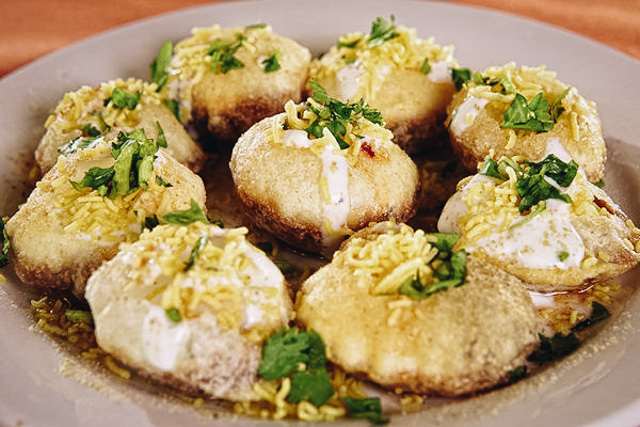 The puri shells are stuffed with potatoes or chickpeas, and are drizzled with yogurt and various spices and tamarind chutney. When it comes to Indian food, anything with the word “pav” means that it is eaten with a bread roll. 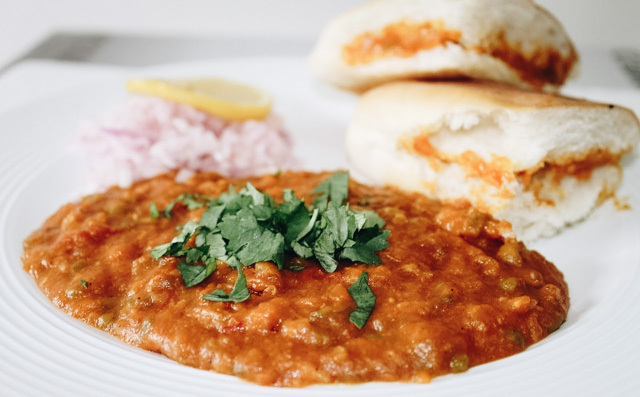 Pav bhaji is a blend of vegetables that is eaten by dipping pieces of the roll into the curry. *Tip: Many Indian foods are eaten with your hands! Make sure to carry hand sanitizer with you! 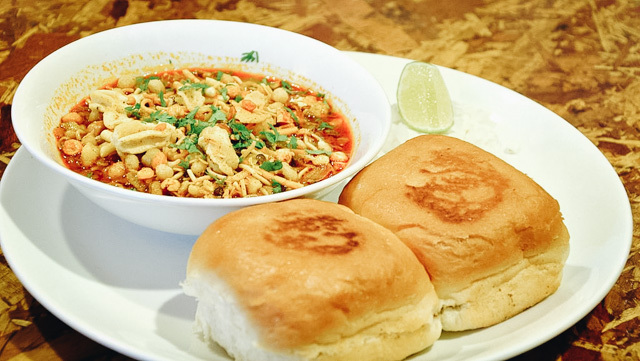 Misal is a spicy curry made from sprouted moth beans. You can get it mild or extremely spicy! 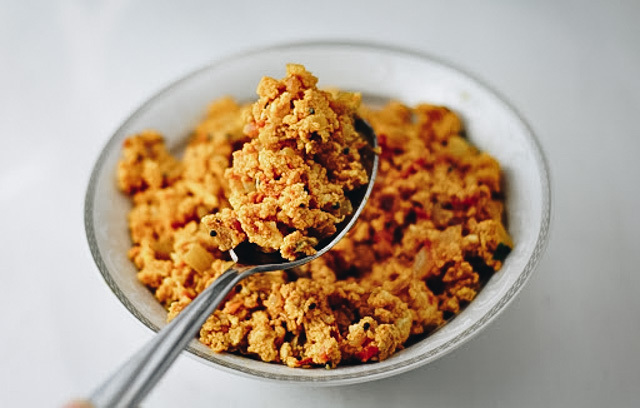 Egg bhurji is made of eggs, chopped onions, tomatoes, and spices. The very first time I tried bhel, I called it a “paper meal”, because it is typically served in paper packaging by street vendors. It’s a delicious combo of puffed rice, bengal gram, peanuts, potatoes, minced onion and tomatoes, turmeric powder, lemon juice, and chat masala! I’m sure you’re familiar with samosas. You know, those delightful potato pockets? Yeah, they taste even better when squished in between a buttered roll. You’re probably familiar with burgers of all kinds. But Indian burgers are something else. 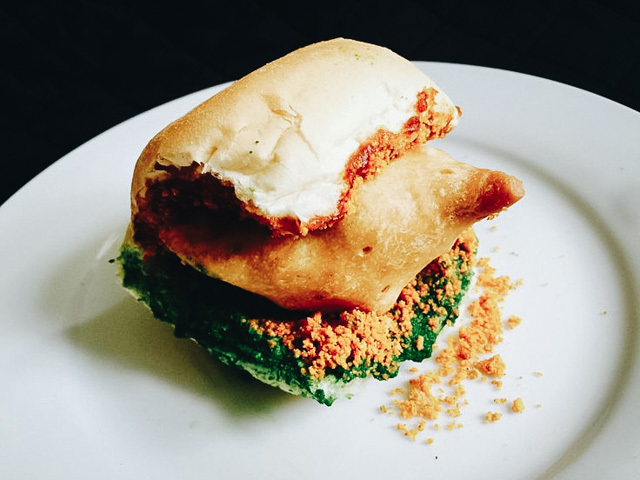 A vada pav is pretty much a burger, but instead of beef or chicken, the patty is made of deep fried potatoes. Yum! 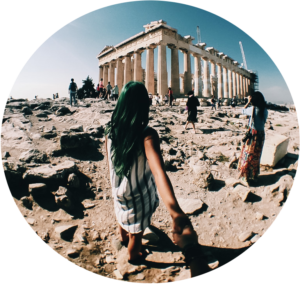 If you’re currently in India or have plans to explore this beautifully diverse country in the future, don’t leave without trying any of the above! Your experience is incomplete without! Oh, and if you’re planning on seeing the Taj Mahal, you should probably read up on my top tips to see it!